Prank-Kids Pranks is a Continuous Spell any deck would love to have in their archetype. Ditch an archetype-specific card, get a token is handy enough. Use the token for anything other than tributing, we saw how great having a token can be for Sky Strikers and Blackwings and other decks love Steam the Cloak. Cycling back 3 archetype-specific cards to draw a card during potentially each turns End Phase is broken. This kind of a card would be limited to one in several archetypes if not banned. The advantage of recycling resources and getting a draw off of it for a Fusion/Link-based deck is like what Blackwings had back in the day with Whirlwind at 3 (before it didn’t matter if Whirlwind is at 3 like today). Start with this card and you are off to the races immediately. This card helps set up Prank-Kids Plan for later, but the ability of Prank-Kids Prank is like a better Backup Soldier: no restrictions aside from the archetype, once per turn, not a one-time thing, and get a draw. Great support for an archetype. Prank-Kids Pranks is a Continuous Spell Card that has two once per turn effects. The first lets you ditch any Prank-Kids card (including a different copy of itself) to Special Summon a Prank-Token. The Token cannot be tributes, but having a monster on the field with the appropriate name sets up combos from your Extra Deck. The second effect lets you shuffle back 3 targeted Prank-Kids cards (except different copies of itself) from the grave back into the deck to draw 1 card during the End Phase. Shuffling the Extra Deck monsters will let you gain the most advantage, but since so many cards are searchable, there really is no downside to the effect other than the end phase clause. That makes Prank-Kids Pranks balanced and worth running at least 2 of in their deck. The more support they get, the more useful/necessary it becomes. Before we get into the Links and Fusions of Prank-Kids, I’d start with some Spell and Trap support, Prank-Kids Pranks. Pranks is a Continuous Spell with two effects that are hard once per turns. First off, you can discard a Prank-Kids card to Special Summon 1 Prank-Kids Token (Pyro/FIRE/Level 1/ATK 0/DEF 0) but it cannot be tributed. This gives you an extra material for a Prank-Kids Fusion or Link Summon so you can get the archetype going. The best card to discard might be Prank-Kids Plan since you can use its GY effect to recycle many of your Prank-Kids in the GY. If you don’t use Plan to recycle the Prank-Kids cards though, Pranks can do it for you since at the End Phase of your turn, you can target 3 Prank-Kids cards in your GY except Pranks and shuffle them into the deck to draw a card. Cool way to gather more advantage recycle your Main Deck monsters, Fusions that tribute themselves to revive Prank-Kids monsters, Links that tribute themselves to add Prank-Kids cards to your hand, you can get back the Prank-Kids Fusion Spell into the deck which is really just a Fusion Spell so that’s why I didn’t chose that for Spell/Trap support, Prank-Kids Place for future searching, or maybe even put back a Prank-Kids Plan into your deck since that lets you Link Summon on the opponent’s turn, and you can also put back the boss monsters since they offer massive field clearing. 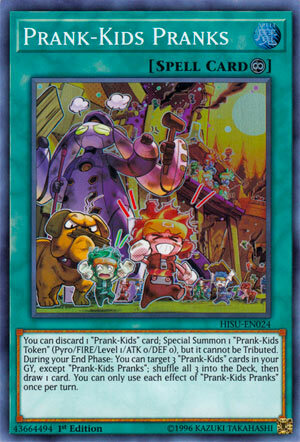 Prank-Kids have a ton of ways to summon monsters, get resources back into the deck or hand, and some strong recycling along with power plays and I thought reviewing Prank-Kids Pranks will be the best way to mention all of that. Pranks is one of the better Spells/Traps in the deck and worthy of throwing in 2-3 copies for that recycling and draw power along with that Token when you need it. Art: 4/5 Kids just love to start trouble now, do they? Prank-Kids Pranks (kind of feel this might be better as a Field Card, it just kinda works that way) but is a fun piece of the Deck. This Continuous Magic card lets you discard a Prank-Kids card (note, not Monster, but card) which is beneficial in more ways than one for the theme, it gets you a meaningless Token you can’t even Tribute (but one you could use for Extra Deck Summoning, I think we noted that was important yesterday). This also can recycle your resources, taking three of your Prank-Kids cards (again, note cards, not Monsters) and shuffling them back into the Deck, which then grants you a Draw. We saw a draw effect yesterday, too, if I recall. You can’t use Pranks with this, and each effect can be used each turn, but again, (stop me if you’ve heard this before) but once a turn. This card is great for the theme. The Continuous aspect obviously hurts, but it dumps, recycles, gives you fodder, and let’s you Draw. It does everything you need, only adding speed to what you should see/know is already a very dangerous Deck. I’d say you’re safe running two of these (the Prank card pool isn’t huge yet, but they will get more cards). Art: 4/5 They look much more menacing than yesterday, don’t they?